The Skylon 2 of the modernised Skylon ellitpical cross trainer series of Kettler is the direct successor of the Skylon 1.1. An easy training control, a smooth concentric run and the very valuable mechanics characterise the Skylon elliptical cross trainer. The Kettler elliptical crosstrainer Skylon 2 is equipped with an 18 kg balance mass system, which offers good ergonomics and a smooth concentric run. The elliptic movement of the Skylon 2 supports the joint-gentle course of motion and protects the ligament and joint system of the body. The arm levers offer many grip possibilities thanks to their curved shape and offer every user the possibility to take the ideal posture. The new console concept is also provided in the new equipment of the Skylon series. Via a central control joystick, you can comfortably navigate through the menu - in a few steps. Due to the angle adjustment of the display, it offers users of any height an optimal view of the training data. All training values are shown and analysed on the clear LCD display. Approved construction, valuable components, and expert manufacturing are among the most important quality features of Kettler products. The handle bars are equipped with alignment ball bearings, other mobile parts are connected via double ball bearings and offer hence a high level of reliability. The longitudinal ribbed belt is silent, low-wear, and transmits evenly the power of motion to the drive system - that favours a smooth and ergonomic training. Der Aufbau des Gerätes ging super fix. Das Trainieren macht mit diesem Getät sehr viel Spaß. Man hat eine tolle Auswahl an Trainingsprogrammen, da ist für jeden etwas dabei. Preis-Leistung stimmt. Ich würde das Gerät definitiv weiterempfehlen. Erg soepele beweging voor een betaalbare prijs. Ik heb de crosstrainer zelf in elkaar gezet en dat was ook wel prima te doen. 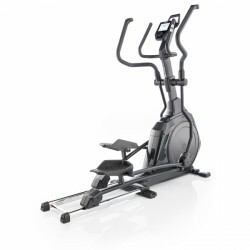 Kettler elliptical crosstrainer Skylon 2 add to comparison list.